New $20 M 66,000-SF building advances the University’s theatre, dance and music programs’ ability to integrate performance with academics. The Center features a new 850-seat concert hall and a 460-seat proscenium theatre. Engaged during programming and pre-design through construction, AD’s team provided focus on faculty, student and guest performers desires and incorporated design elements to meet their needs and achieve an efficient, acoustically precise facility. Challenges included accommodating a tight budget and were addressed through a simple yet elegant architectural solution. 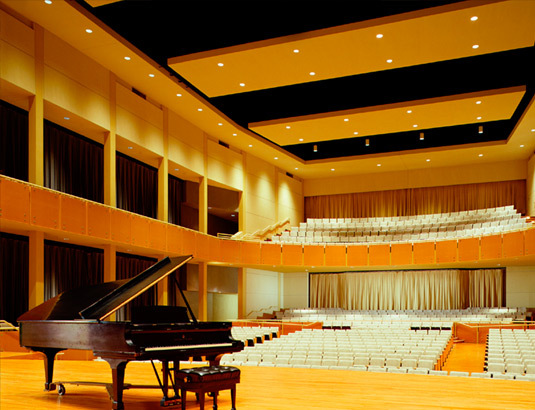 The Hall’s “liveness” can be “tuned” for different types of performances by opening or closing drapes on the walls and adjusting acoustical “clouds” and panels hanging from the ceiling. Sound isolation was also a main concern as the theatre and the concert hall are adjacent to each other. Through close collaboration with the architect, concerns were met through an isolated hallway between the two auditoriums providing an acoustical barrier and serving the practical function of giving patrons a way to get from the parking garage to the lobby. AD also designed the sound systems for the new theatre and concert hall. Design accommodated a phased approach to enable implementation as funds became available. A rich warm sound is the result of solid masonry wall surfaces and concrete floors. Adjustable acoustic elements enable flexibility for tuning the hall for different performance types. The new Center integrated performance and academic functionality through creative design approaches to meet faculty, student and guest performer needs, convey elegance and comply with budget limitations.